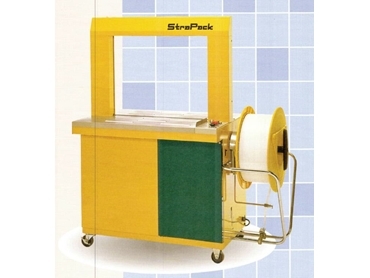 Live Industrial supplies a new line of high performance automatic strapping machines with a strapping speed of 1.5 seconds per strapping cycle. Capable of strapping 40 straps per minute, the high speed Strapack RQ-8 automatic strapping machines are portable in design. Heavy-duty metal casters allow the equipment to be quickly installed or moved to any single phase power supply outlet. RQ-8 automatic strapping machines feature an innovative self-correcting mechanism, specifically designed for instances when the machine is operated accidentally without a package on the table. The self-correcting technology enables the strap to form a small loop, which will be automatically ejected from the sealing unit leaving the machine ready for the next cycle. Strap loading is a simple process in the RQ-8 automatic strappers and can be done at the touch of a lever. Strapack's self-lubricating design ensures long-term durability and maintenance-free operation. A quick heater ready to operate in less than 25 seconds is designed to ensure high seal joint. The self-diagnostic function involves a programmable microprocessor that constantly monitors critical functions and displays any irregularity sensed during operation. Tension capability up to 80kg is available to the operator using a single tension dial. Strapack's advanced bandway design ensures perfect strap placement and eliminates any twisted straps.